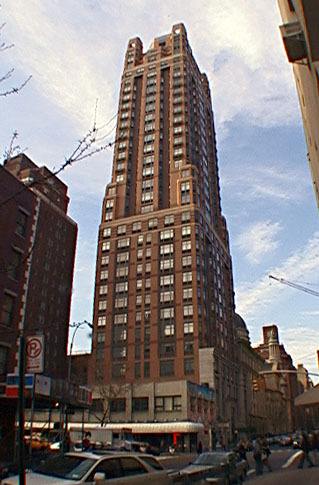 By purchasing the air rights from the adjacent and very beautiful St. Jean Baptiste Roman Catholic Church on Lexington Avenue designed by Nicholas Serracino and erected in 1913, the developers were able to create a most imposing and impressive tower of considerable power. The tower pays respect to the impressive church structure with a base of cast stone and granite that matches the cornice line of the church's rectory and a quite complex top to the red-brick, chamfered tower. 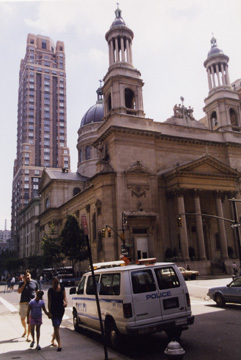 In their great book, "New York 2000, Architecture and Urbanism Between The Bicentennial And The Millennium" (The Monacelli Press, 2006, Robert A. M. Stern, David Fishman and Jacob Tilove said that the tower complemented the church "not by mimicking its style but by echoing the geometry of its corner bell towers with corner towers of its own surrounding a thirty-five-foot-high octagonal mechanical equipment enclosure at the top." "Few could dispute the contribution that the Siena's rich sculptural form and lively surface patterning made to a neighborhood burdened by so many uninspired blocklike apartment buildings," they remarked. 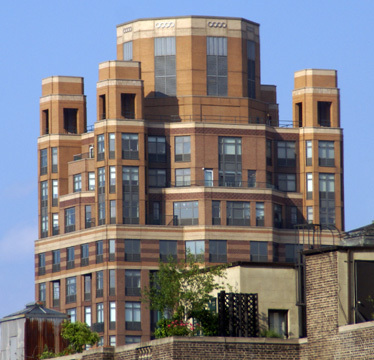 Designed by Hardy Holzman Pfeiffer Associates and Schuman, Lichtenstein, Claman & Efron, this 31-story apartment is one of the best Post-Modern designs in the city. The tower's form is well proportioned and finely detailed with setbacks and recesses. 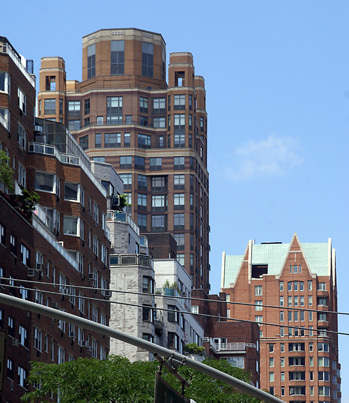 Frederick P. Rose, Daniel Rose, Adam R. Rose, Daniel Brodsky and Robert Quinlan were the developers of this very handsome project that contains 125 condominium apartments, more than half of which are larger than two-bedrooms. The building has two floors of medical offices. Its site was formerly a parking lot.